This generously sized, thirsty beach towel dries you off in a big way and makes for a comfortable way to lounge by the pool or in the sand. 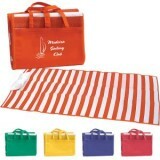 Choose one of our great colors and then personalize it for your beach-themed party. 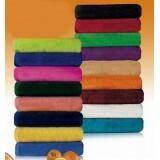 The 100% cotton terry velour is highly absorbent, the hemmed edges provide extra durability. 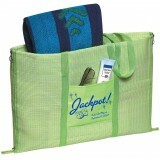 Each towel measures 35" wide and 62" long and heavy weight at over a pound per towel! 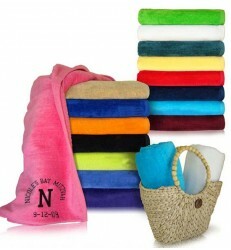 A beach towel is usually a little bit larger than a bath towel. Although it is often used for drying off after being in the water, its chief purpose is to provide a surface to lie on. They are also worn for privacy while changing clothes in a public area, and for wiping sand from the body or objects. 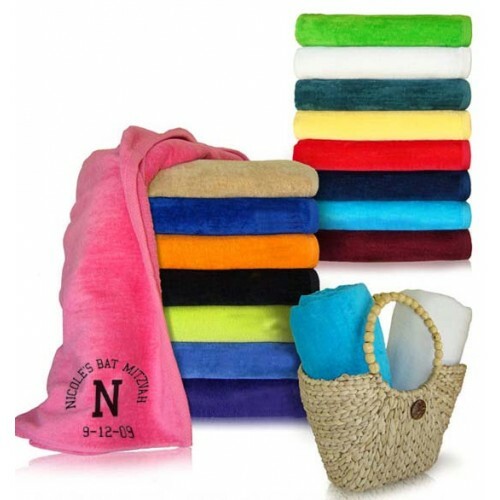 Beach towels often have colorful patterns.To sit, lie and stand on, to avoid direct contact with the ground, sand, rock, chair, etc.